The first show in this city since the September 1999 radio sponsored club show during the Euphoria tour. The show was played as part of the Houston Rodeo event. A revolving circular stage was set up on the rodeo floor in the arena. Large video screens were hung above the stage showing close ups of the band as they played. The band had posted small audio messages for the official site recorded backstage before they went on. This was the third largest US crowd the band had played to at this time after the San Diego headline stadium show in 1983 and various outdoor festival dates in 1980 (including Cleveland Stadium supporting Bob Seger). The shorter setlist included mainly greatest hits. 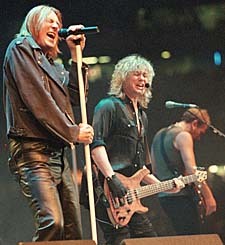 In early February 2000 the band had scheduled seven dates at the end of the month concluding with two nights at this venue. These shows did not go on sale and were removed from the schedule.